When deciding which stove to purchase for the BWCA one thing was clear. I did NOT want to haul in a bunch of fuel. I don’t know if it was the idea of the added weight, or the potential for screwing something up with the canister etc. but the MSR type stoves really made me nervous for some reason. 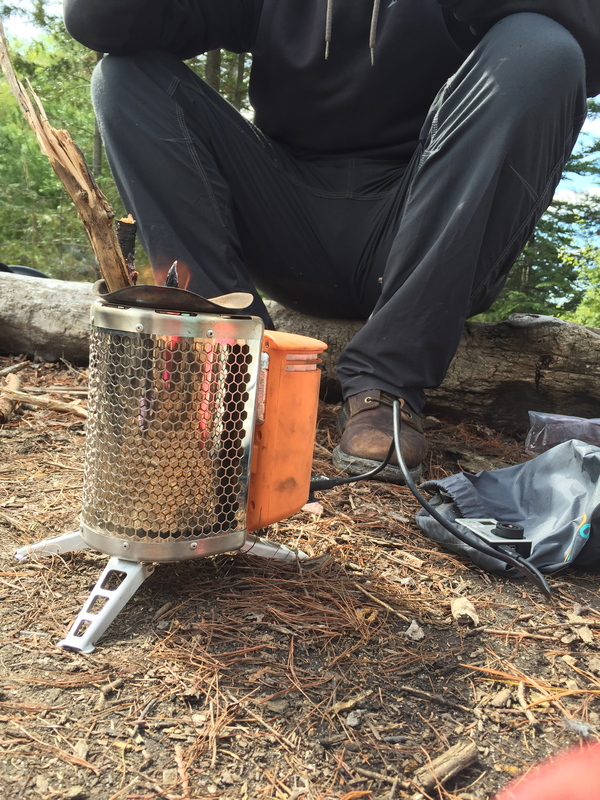 I had contemplated just skipping the stove option all together – to opt for cooking on the fire grate until I ran across the Biolite stove. Small, compact, and using NO fuel whatsoever except mother natures sticks, and fallen branches – i was immediately intrigued, while also remaining highly skeptical. I mean really – you just add twigs to it, click a light of fire and you’re set to go – with the fan charging the fan by itself? At $130 a pop – this was not something I wanted to just “try” if it did not work. We decided to purchase EVERY piece of equipment needed for canoe camping since we decided early on that this was going to be our new ‘thing’ – so I did not want to waste money on an item that wouldn’t work. The worker at REI swore that the thing worked amazing – but still I remained skeptical. I put the stove on my REI wishlist that our family suggested we make for ideas for Christmas/birthday gifts last year, and low and behold my mother-in-law purchased this for me for my birthday! I was floored to try it because we likely wouldn’t have purchased it on our own. On Christmas Eve we took our GSR Cook set along with some branches from the fireplace and tried it out. Much to our surprise in just 8 minutes we had boiling water [faster than our kitchen stove]- and were able to charge our iPhones as well. I was instantly impressed and was ready to use it in the North Woods. 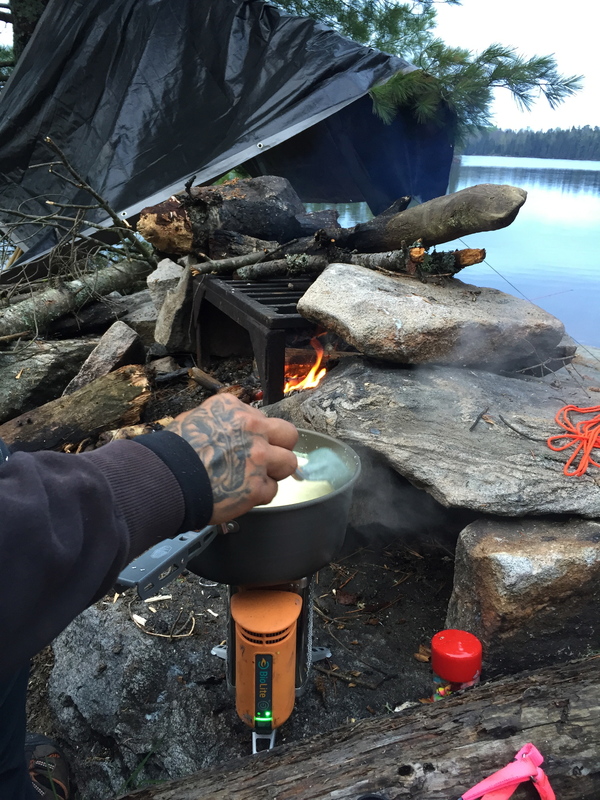 Upon entry into the BWCA our first meal was actually right on the fire grate – but thereafter we used our Biolite stove for every meal. We had our 7 year old daughter “hunt” for some smaller sticks/twigs and branches and form a little pile. This was always her camp chore which was easy for her – and never had a complaint of “its too heavy”. We always gathered “quite” the little pile. Perhaps the amount of sticks/twigs that would fit in an average shoe box. Yes. You do have to re-stoke the stove by adding more in, but as long as you have all of the sticks/twigs gathered it’s easy peasy. The food heated quickly without any worry of added canisters/fuel and the worry of running out or using too much etc. As far as the charging went – it went okay. I kept my iPhone 6 in airplane mode and charged it every night at dinner keeping it consistently in that 50-60% charge. 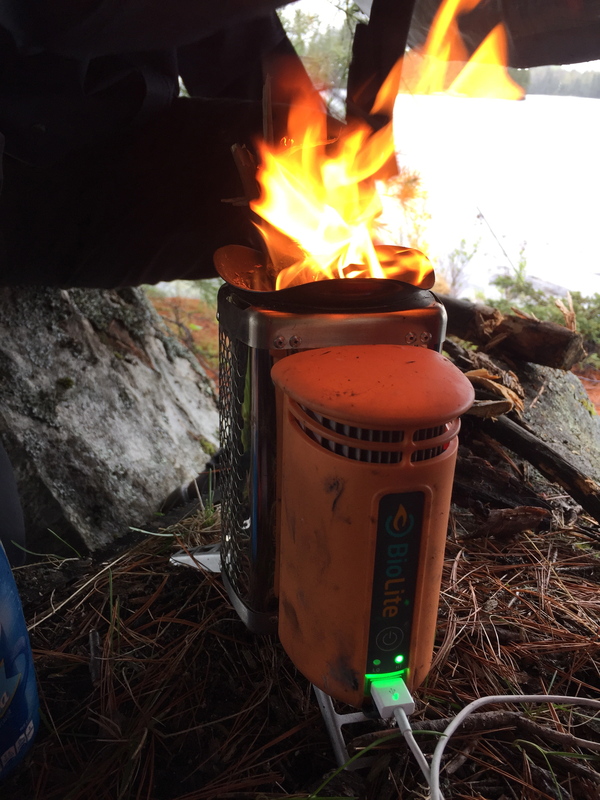 The BioLite Stove worked excellently for us since we experienced steady rain and snow for the first part of our trip making it difficult to keep the regular camp fire going. Being able to fire up the BioLite under the tarp was hugely beneficial, and we were even able to warm our hands on it! We also thought it cooled down exceptionally fast being able to store it quickly in its nylon stuff sack. I’m excited to try out the accessories on our next trip! All in all I would give the BioLite 5 Stars out of 5 and was thoroughly impressed by it! Give it a try this summer or next! 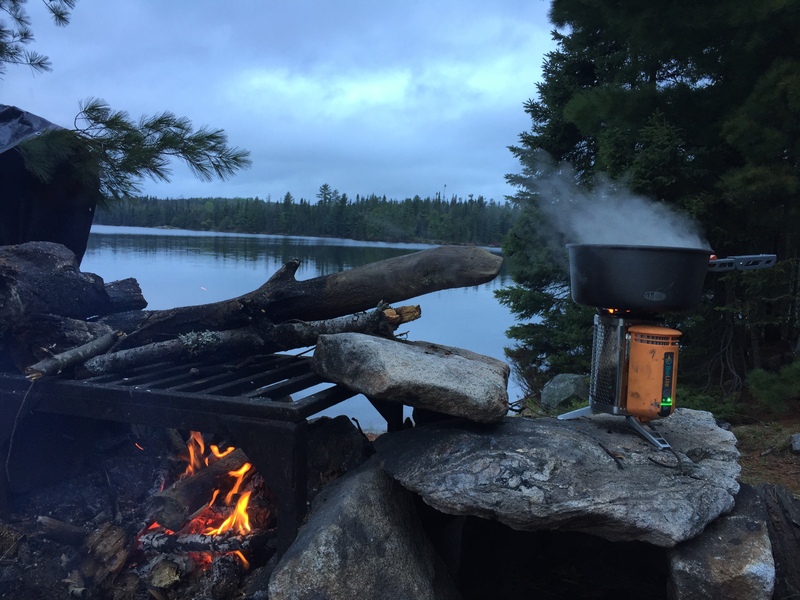 LA • This entry was posted in Fun and tagged BioLite Stove, Boundary waters, BWCA, BWCAW, Camp Cooking, Camping, Canoecamping, Canoing, Cooking, Minnesota, REI. Bookmark the permalink.